We’ve had an Eastern Phoebe couple living in a nest above the Front Porch door since we arrived in 2007. 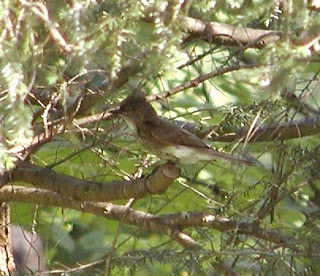 Eastern Phoebes (one of ours is shown above, hanging out in a hemlock) are small, brown and white birds. They do a lot of tail wagging, which we’d love to capture on video. Phoebes eat insects and like to build their nests under bridges and eaves of buildings. Our Phoebes have done some great renovations to their nest this year, adding moss and other nice little touches. This year, they also had two babies…unfortunately, having two new little ones seemed to make it a challenge for the Phoebes to keep up with their home repairs. One morning a couple of weeks ago, one of the Phoebes began frantically flying in front of the solarium windows before breakfast, so Brigette went to check on the nest. The top of the nest had cracked off and was hanging down along the Front Porch door and two little Phoebe chicks sat huddled together on the stoop. While guests had their breakfast, Dave and Brigette came up with a plan to do some quick home repair. 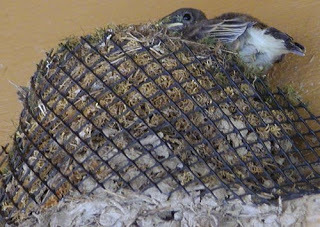 Dave put the top back on the nest, and hammered a piece of plastic gutter guard (which looks a little like netting) into the door frame on each side of the nest, securing it in place. Phoebe chicks were placed gently back in the nest while the parents looked on. After about 20 minutes, mama Phoebe checked on the kids and all was again right with the world. Every morning for four or five days, Brigette checked on the babies, and then one morning, she saw a flying lesson going on. It was so great to see the Phoebe kids fly off on their own. If you’d like to come see the Phoebes and the many other species of birds at the Inn on Mill Creek, we’re a proud site on the North Carolina Birding Trail. The public can visit the property by phone or e-mail appointment. 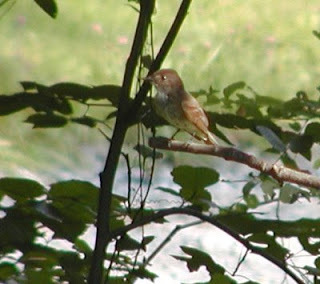 This entry was posted in Uncategorized and tagged birding, outdoors by Inn on Mill Creek. Bookmark the permalink.